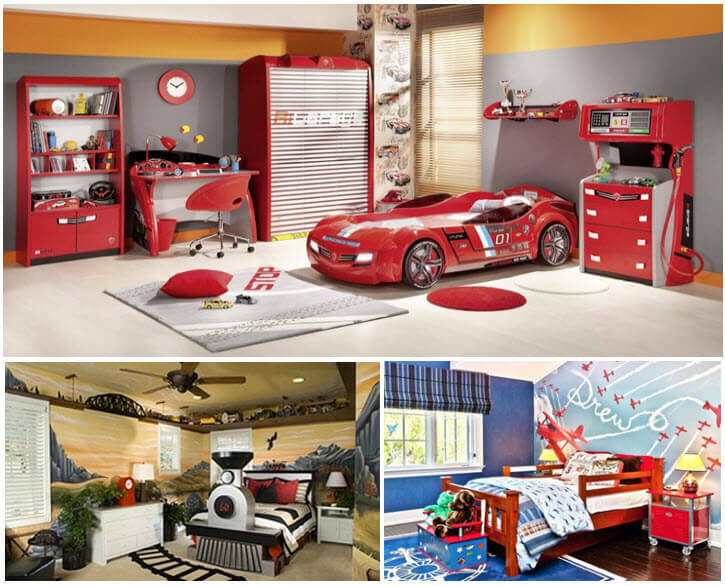 Kids’ bedrooms are about fun, fancy, creativity and imagination. The fun thing about decorating their bedroom is the varieties of themes to look for. Decorating your naughty ones’ bedroom is fun which requires lots of thinking and planning. Cause we have to consider their favorites, likes, personality, styles and many more which keeps on changing from time to time. Doing your kids décor varies from time to time as they grow up very soon completing each cycles from toddlers to teens. Boys are more into actions, sports, cars, superheroes and moreover BLUE. 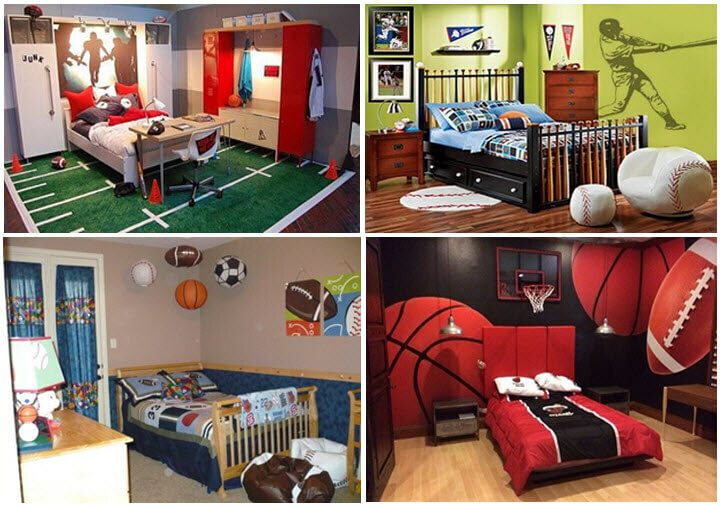 So, here are few creative bedroom décor themes for boys till pre-teen stage that would give you many ideas for inspiration. Boys loooooves wheels. Can’t separate them from these. Bring the wheels into their room by knowing their favorites and incorporating them all over. Car based theme or train or airplane can be decorated in their room either by putting a theme based wallpapers or stickers or you can also get a car bed in the market easily. Design the furniture’s accordingly to give it a themed look. Boys always dream about being themselves as superhero and rescuing toys and people. 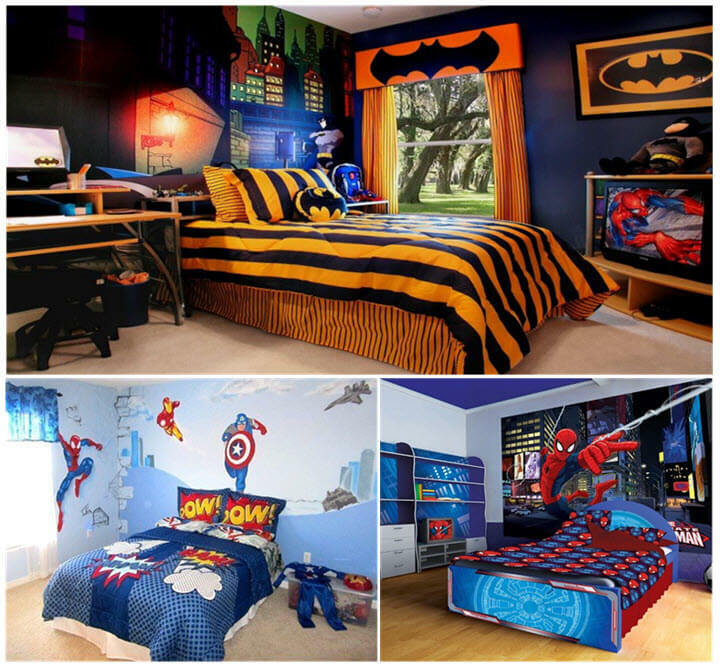 Decorate your naughty’s bedroom with these superhero themed décor and let them slip into the dream of rescuing. Indulging in theme based bedding, bedspreads, wallpapers, stickers, toys, wall hangings, carpets for bedroom decor can make dream come true for your precious ones. Your kids would love to have these around while growing up. 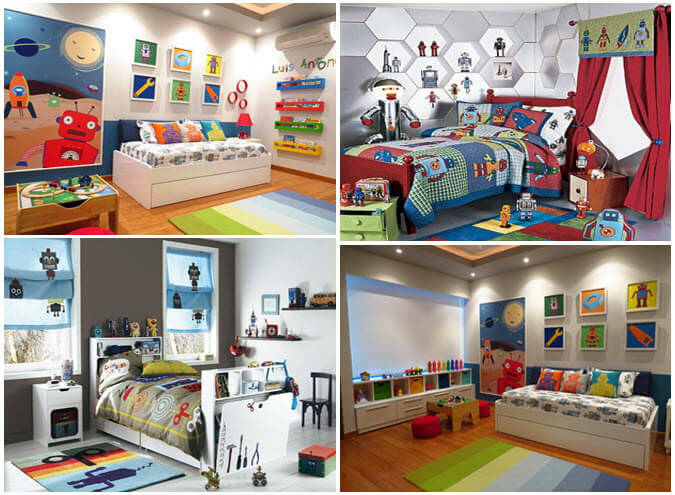 Set up your kids dream into reality by designing the room with his favorite cartoon theme. Many options like Disney, Winnie the Pooh, Kung Fu Panda, Tom and Jerry, Shaun the sheep, Doraemon, Minions and many more are available to play around. How cool is that? This sports based themed décor is so fun and creative for your little athletes. They would be happy to showcase their rooms to their buddies which is sure gonna be the talk of the classroom. This unique décor theme is a must for all the sporty loving chaps. Ready to launch your ship in 3, 2, 1.. Boom!! Mission Accomplished!!! What a better way to bring his dreams into his room. Your little astronaut would be very excited to have such bedroom for himself. Exploring and learning would be fun and exciting with 3D wall art and solar system hangings around. Enjoy the joy in watching as your kid’s face light up by these futuristic robotic themed décors. Design your little scientist room with colorful robot wallpaper, robot shaped shelf, robot curtains, carpets, bedsheets and many more. Let his mind travel through endless imaginations into the future with robots all around. Boys like to be adventurous. Bring the walls real and alive with these 3D dinosaur wall painting and art. Let your little one’s imagination run wild with these 3D images of large dinosaur and stone walls as if they are ready to come out of the walls. They are sure to have fun and enjoy the theatrical Hollywood setting in their room with these décors. Boys and blue go hand in hand. Their favorite color is blue. Everything they want in blue color. Be it toys, or pencil box or even clothes. So why not decorate their room fully in blue. Let’s get their friends envy on seeing your kids room. Color based themed décor has an advantage that this décor can be in for a very long period of time. You don’t need to change for a longer time even if your kids grow old to teens. Decorating kid’s bedroom are fun and exciting. Choose matching rugs, curtains, bedspreads, shelves, wallpapers, wall stickers and many more to trigger their imagination level to new heights. Have fun in decorating and let your little one’s dream come into reality. Have FUN!! BOY oh BOY! !